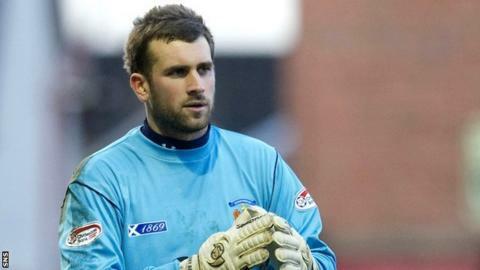 Kilmarnock manager Kenny Shiels has revealed Ipswich Town have made an approach for goalkeeper Cammy Bell. "Ipswich Town are in for him and there are other clubs that have made approaches from England," said Shiels. "I will sit down with him, maybe in March, and we'll have a wee discussion about what he feels is the best way forward for his career." However, Shiels is convinced that Bell will be a success wherever he moves to. "I will give him my advice and he will make his decision from there," explained the manager. "What will I tell him? That's personal between me and him but hopefully it is good advice. "Wherever he goes to, he will be first choice. There is no doubt about that." The 26-year-old has spent his entire career at the Ayrshire club, apart from loan spells at Montrose and Queen of the South. Bell has one Scotland cap, coming on as a substitute against Faroe Islands in 2010. Meanwhile, Rangers manager Ally McCoist says his club have held discussions with Bell's agent. The Ibrox club are currently subject to a transfer embargo and will not be able to register new players until 1 September. "Players like Cammy do automatically fit the bill because they are out of contract," said McCoist.